The price of Steem has been on uptrend over the last week it is currently at the time of this post just over $0.30 up from $0.28 just a few days ago, and I think there are at least a few reasons why. This price may not hold, but there are numerous things that have happened recently with Steem that I would consider positive. Also, @therealwolf has been working on adding Steem to various Dapp platforms including StateofTheDapps, DappReview, and more. Not only this but I think since Steem is starting to be seen more as a great place to build a new Dapp we have a lot of new Dapps on the blockchain including the very new DrugWars game which has grown very quickly, MagicDice still has a lot of users, and Steem Monsters still has over 2,000 users. Steem Apps Further, there are several new Dapps on Steem including WhereIn, Share2Steem, SteemBounty, and more which have recently increased their total number of users. Actifit has also recently been growing their number of users quickly. Plenty of more Dapps that I didn't have time to include. I admit that Twitter and Steemit are currently my 2 most used sources of crypto information and the Steemit Twitter account wasn't providing consistent updates. However, they have changed this by providing more updates or at least retweeting other important posts on Steemit. Let's hope they keep this activity up. I admit that when I look at a cryptocurrency project, if they haven't made a post in over 2 weeks it doesn't look as attractive to me. The exceptions to this for me are much larger projects like Bitcoin and Ethereum, but Steem has a lot more growth ahead of it in my opinion. 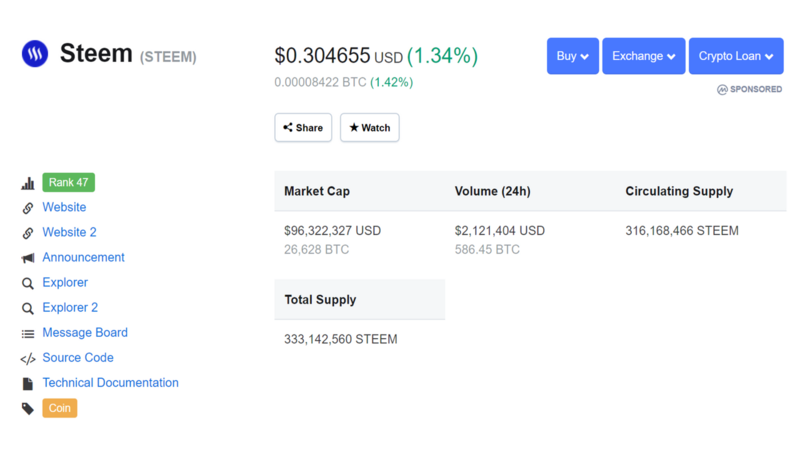 Also, you may not notice it right away but the Steem logo on Coinmarketcap is now more of a solid blue color. It looks a little more professional in my opinion. Also, Steem Engine is a great addition to Steem as a simple way to create new tokens on top of the Steem blockchain. https://steem-engine.com/ It will be great once they get this to be a full functioning platform as well to launch a new business or idea on top of Steem. You can currently create your own token for about 100 Steem, don't quote me on that. I don't know about you, but as long as Steem is a place where we can collectively continue to vote on important decisions being made I'm willing to stick around. Also, I think Blocktrades handled the voting results of their recent poll pretty well overall. The long term game with Steem is starting to look good and selling Steem is starting to feel like a bad decision once again. Just my opinion, not financial advice.